Great Copy Pattern #1240. Ladies Zip Front Jacket and Vest, Bias Pull On Skirt. Pattern is multi-sized including Ex-sm thru Ex-lg. The bias pull-on skirt is cut for smoothenss over the hip, and flaring slightly below, it's 31 1/2" with a narrow elastic waist. The jacket features a shirt collar and zip front closure. The vest has a v-neck with facings and zip front closure. Skirt- Duplicate the ready to wear look with a soft woven fabric, such as, rayon challis, silk or cotton. Jacket and Vest - For best results and to duplicate the look of ready to wear use a medium weight knit, such as, french terry, fleece, quilted or doubleknit. Soft woven is also suitable, such as, boucle, chenille and soft suiting. 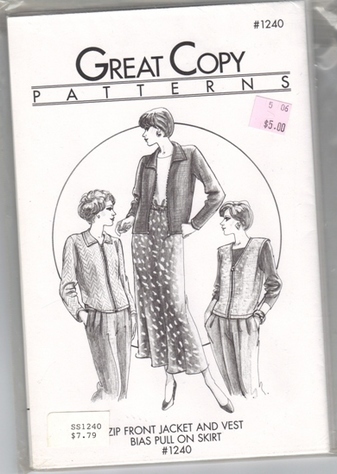 Pattern is new, uncut and in original packaging.